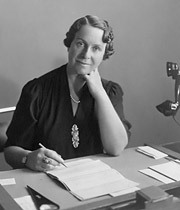 In 1924, Mrs. M.L. Matthews, a member of the Women's Engineering Society (WES) council, conceived the idea of "a scheme popularising the domestic use of electricity". Mrs Matthews first presented the idea to the Institution of Electrical Engineers (IEE) in a paper to fulfil the requirement for associate membership of the Institution. It was rejected. Undaunted, she submitted it to the Electrical Development Association, which also refused it. She next submitted her paper to the WES, where Haslett was still the secretary. The WES council accepted the idea and its special purposes committee decided on 20th June 1924 that a committee of the society, along with one or two representative people from outside of the organization, should be "formed to enquire into the possibility of carrying out the objects of the paper". The new committee decided to form a "Women’s Electrical Association". On 12th November 1924, Lady Parsons convened in her home a special meeting of WES members, prominent electrical engineers and representatives of women's groups in order to form a Women's Electrical Association. Mrs Matthews explained her ideas: "When I was haymaking once during the war, an old farmhand came to me and said, 'Now ma'am, this is a job where you can work hard or you can work light. What you want to do is to work light'. I've never forgotten that, and I look round and see lots of women working hard when they might work 'light' with equally effective results. That is where electricity can help ..."
Her audience agreed and the meeting inaugurated the Women's Electrical Association (WEA). It held its first council meeting on 16th December and appointed Haslett its director. On 30th April 1925, to avoid confusion with the initials of the Workers' Educational Association, the name was changed to the Electrical Association for Women (EAW). The WES, to which Haslett remained secretary, gave office space to the new organisation. Her appointment as director of the association was inspired, and Haslett and the EAW soon made their mark. She was adept at soliciting help and financial support from prominent figures in the electrical industry and trades union movement, and organisations such as the British Electrical & Allied Manufacturers' Association and the Cable Makers' Association offered their support. Two electrical industry pioneers were instrumental in the early years of the EAW. The first was Colonel R.E.B. Crompton, who designed lighting systems for Windsor Castle, Vienna State Opera and the Savoy Theatre (one of the first examples of public lighting in London). The other was Sebastian Ziani de Ferranti, who designed the Deptford Power Station (now demolished), in its day one of the largest generating stations in Europe, designed to transmit electricity at high voltage from (the then) out of town to the city centre where it was needed. In 1927, the EAW moved to new quarters in Kensington made available by Col. Crompton, and in January 1933, the rapidly expanding association moved to larger premises in Regent Street, right in the centre of London. 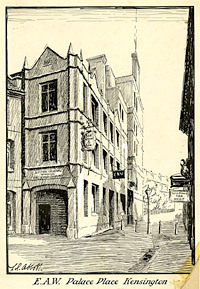 In the early days, both the General Electric Company (GEC) and the Electric Lamp Manufacturers Association lent premises for committee meetings, and in 1933 Haslett secured a large grant from Sir Andrew Duncan, chairman of the Central Electricity Board, to carry out a large-scale programme to educate women to make the best use of electricity in the home. The EAW grew rapidly and branches were soon established in Glasgow, Birmingham and Manchester. 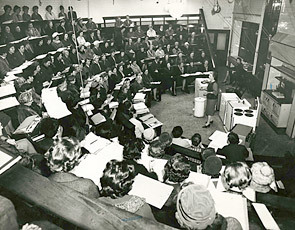 In addition to branch activities designed to educate women about all aspects of electrical technology and its domestic use, the association ran the occasional speaker's course, often opened by Haslett with a short talk. Indeed, education was one of the primary aims of the EAW, which it pursued through its journal, edited by Haslett, and through lectures, summer schools for teachers and school visits, amongst other activities. By 1933 the EAW was accepted as the primary communicator and educational establishment with regard to electricity and its domestic applications. That year the association was incorporated, its aims being "to make provision for the education of, and to give instruction and training to women and others [about] electrical energy ... domestic science, hygiene and social welfare; to promote, encourage and further education and research relating to the use of electrical energy in connection with matters of particular interest to women ... [and] to examine persons as to their knowledge with respect to electrical energy and [its] use ... and domestic science". Electrical safety was another important facet of the programme. These aims remained the basis of its activities for the next 50 years. The EAW electrical housecraft course was given at most domestic science and technical colleges in the country. A certificate and diploma in electrical housecraft for teachers in schools and colleges followed instruction on "the application of electricity to household duties". 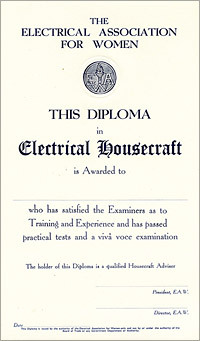 The Diploma for Demonstrators and Saleswomen was first offered in 1931, and by the 1940s its Electrical Housecraft Certificate and diploma were recognised qualifications. A home worker's certificate was introduced for housewives and students, covering electricity generation and transmission, home installation of meters, fuses, switches, cookery, refrigeration, kitchen planning and similar applications. The EAW continued to flourish after Haslett's death in 1957, but by the mid-1980s it was no longer attracting new members and was voluntarily dissolved in 1986. 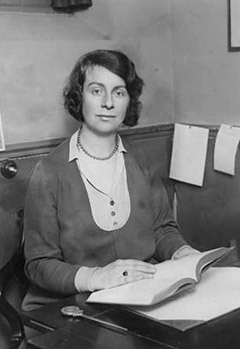 Caroline Haslett in 1924, at the time of the founding of the Electrical Association for Women. She was its first director. The EAW's Electrical Housecraft Diploma became a recognised qualification for teachers in schools and colleges.